SIS Digital has taken the wraps off Leeds’ largest full motion LED screen. The installation is on The Pinnacle, on Bond Street has been completed on behalf of building owners, the Moorfield Group. It measures 3,600mm wide x 6,600mm high - with a full canvass of 23.04 sq m - the company has plumped for the Philips Showall 10 (LED 10mm full colour LED screen) as its screen of choice. The new screen has in-built wireless and near-field capability with 5,500 Nits allowing the images to stay clear in bright daylight, while the 10mm SMD LED panels incorporate full motion smart screen technology. 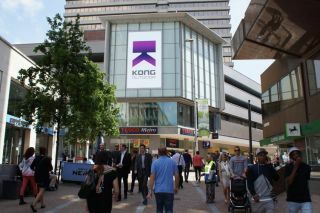 SIS Digital, which has its design base in London, its manufacturing division in Peterborough and a northern outpost in Harrogate, provides a “turnkey” service to media companies, shopping centers, retailers and major sports clubs looking to join the digital signage industry.